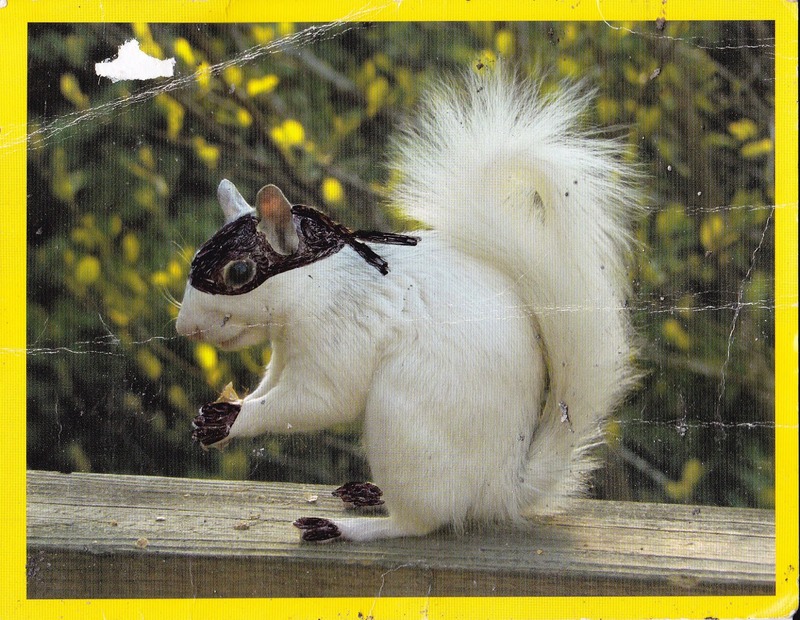 I learned about the White Squirrel in August of 2008. That year I spent the last week of July doing some nerdy history stuff at George Washington's Mount Vernon. I left Alexandria, VA and, instead of heading back north to Pennsylvania, I drove to Brevard, North Carolina. The previous year, my friends, Mark, Glenn, Mikey, and I spent four days mountain biking near Blackwater Falls, West Virginia. On the way home from that trip we began to plan what we would do the next summer. Mark steered us towards Pisgah National Forest in western North Carolina. Mikey didn't make it on this trip (his responsibilities to his little ones kept him at home)....but Kristian did. 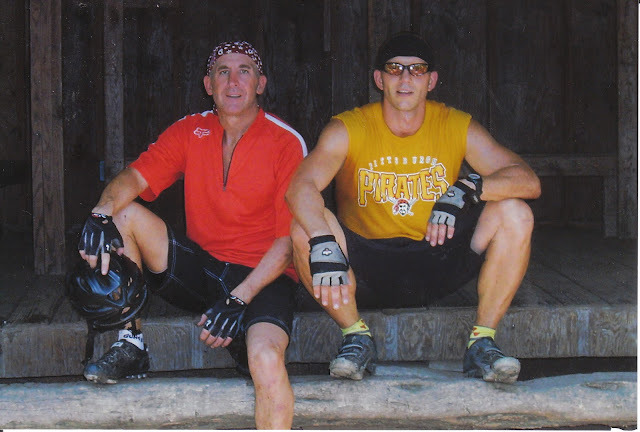 Mark, Glenn, and Kristian picked up my mountain biking gear for me before heading out of Pennsylvania. 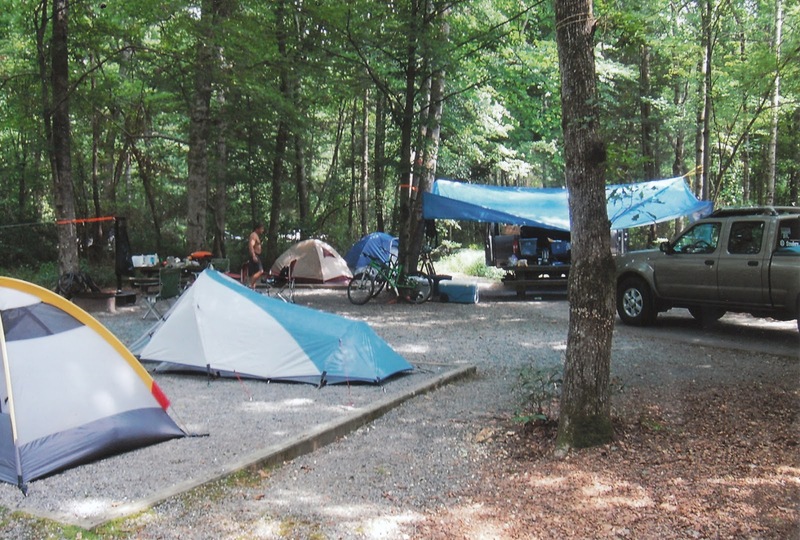 They ended up beating me to the campgrounds in Pisgah National Forest by twelve hours. 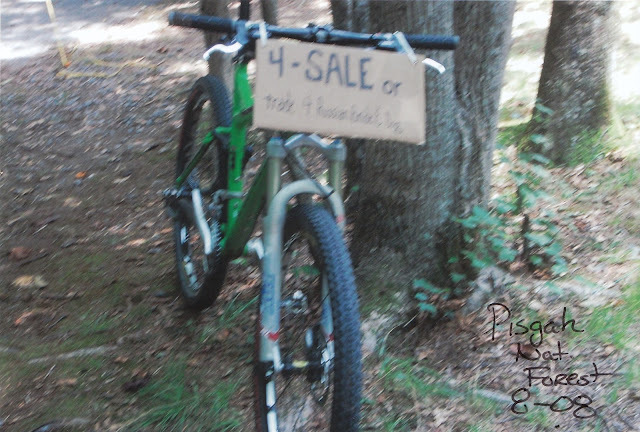 By time I got there, they had the camp set up, and my bike "for sale" at the campground gate. Camping with Mark Lentz is easy. He won't let you do anything. I've learned a lot over the years from camping with him. All I had to do when I got there was unpack, set up my one man tent, and get ready to ride. Mark had already mapped out our first ride. 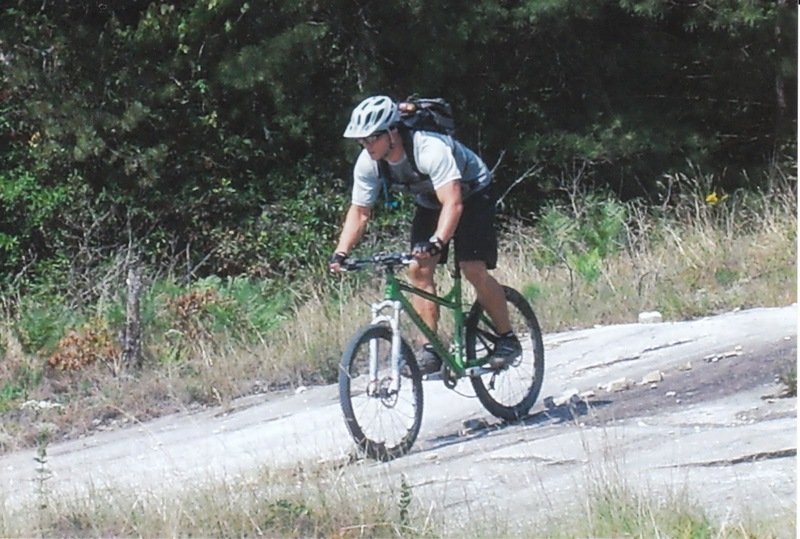 Back in those days, I didn't have a Garmin to track my routes...but, from what I remember, our ride that day was hot, humid, and seeming uphill forever. 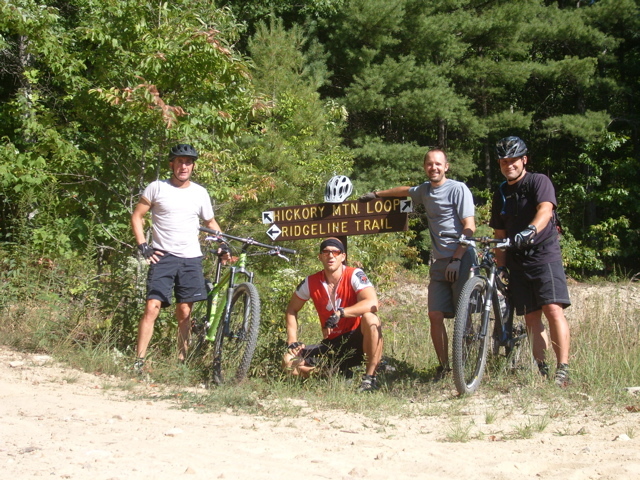 I can't even begin to tell you exactly where we rode...just that we accessed the trails from near the campground. 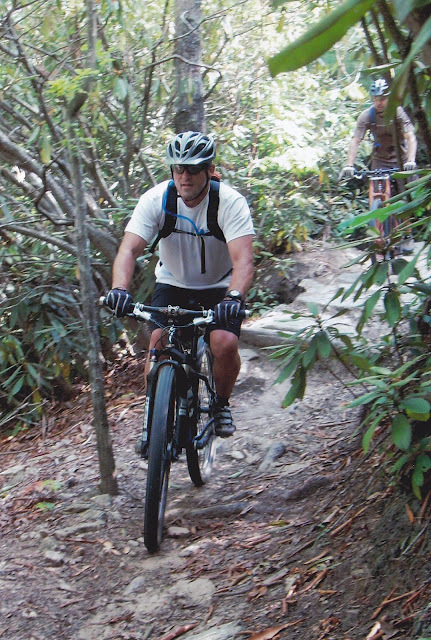 I remember finding a shelter near the top of the mountain and riding down the remnants of a pretty steep and washed out "trail." The real fun began the next day. Getting up early, we ate breakfast, packed our gear into Kristian's truck, and headed to DuPont State Forest. This ride was one of the most memorable rides of my life. A day of exploration, mischief, some really incredible mountain biking! 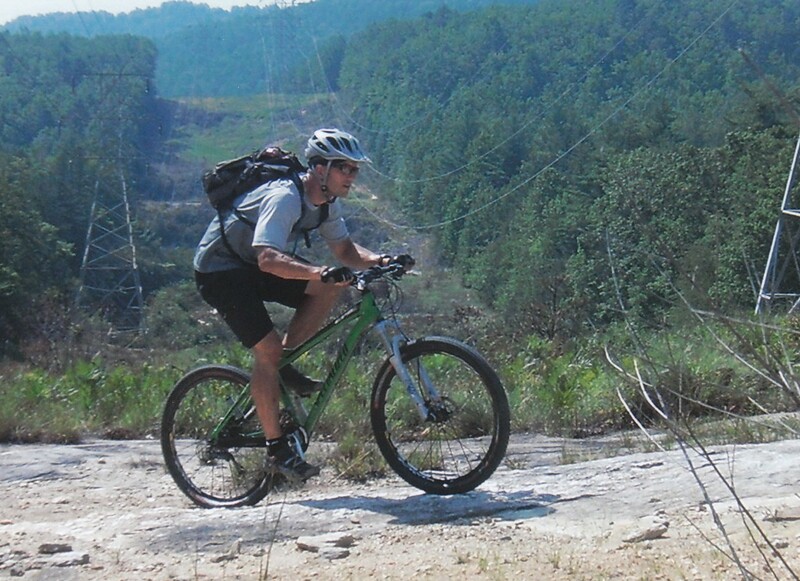 Our ride that day began with a ride up Ridgeline Trail...possibly my favorite trail I had ever ridden. More about that later. 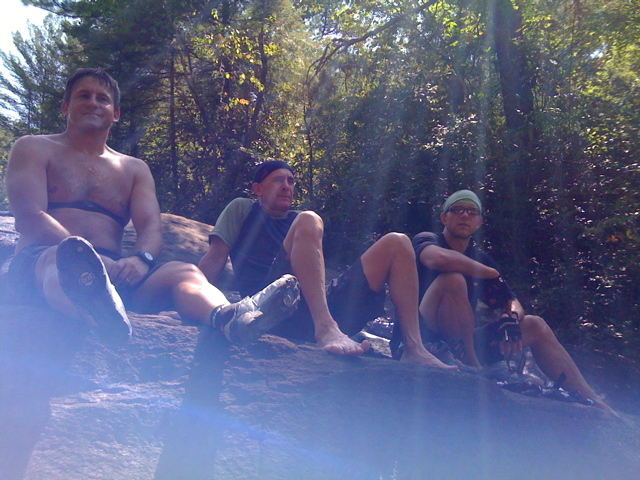 We set out that day to ride the "slick rock" on the top of the mountain. I had never experienced riding like this...no trail, just large flat rocks that went up and up. We paused near a group of wooden signs to take a photo and catch our breath. 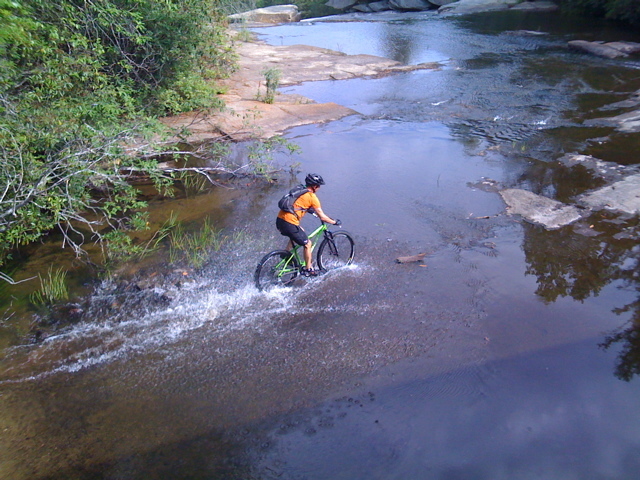 Our ride that day didn't end with the slick rock. Mark was trying to guide us to the waterfalls that were in the area. Along the way we encountered some pretty irritable park rangers, a danger sign here and there, and one pretty incredible stream crossing. We were heading for Triple Falls. A spectacular sight. 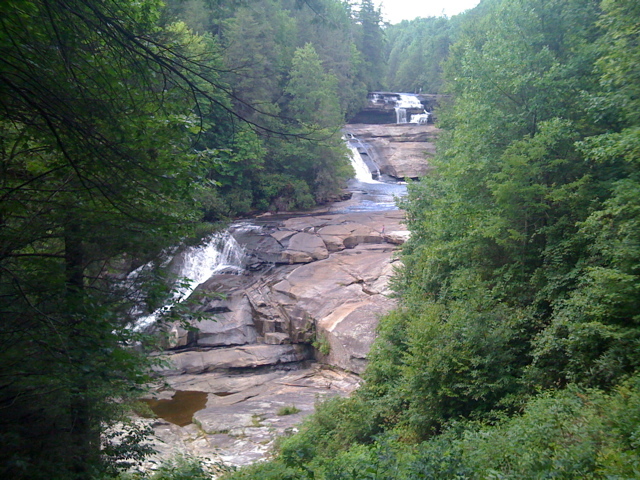 At the top of the falls there is a covered bridge. If I remember correctly, the conversation went something like this..."do you think we can ride across the stream?" 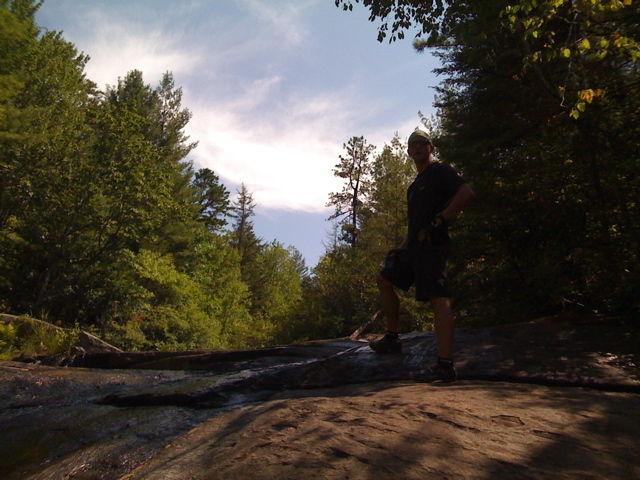 For me, the idea of crossing that stream at the top of Triple Falls was out of the question...but not for Glenn. 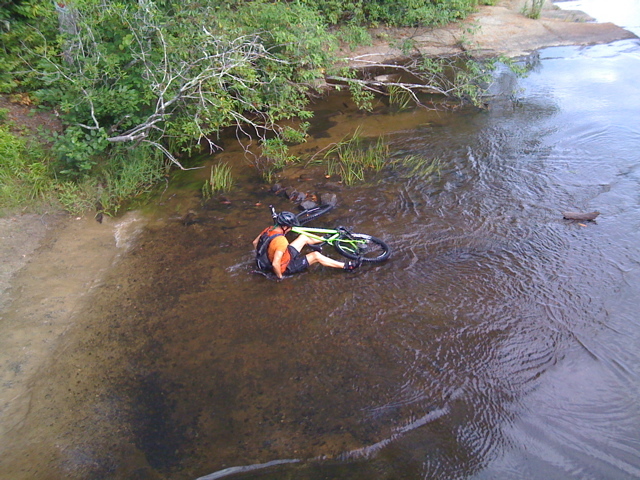 He put the front tire of his new 9er into the water and headed across. We cheered him on from the bridge...and then egged him on to come back. 99% of way back across the stream and...down goes Glenn!. My very first YouTube video! 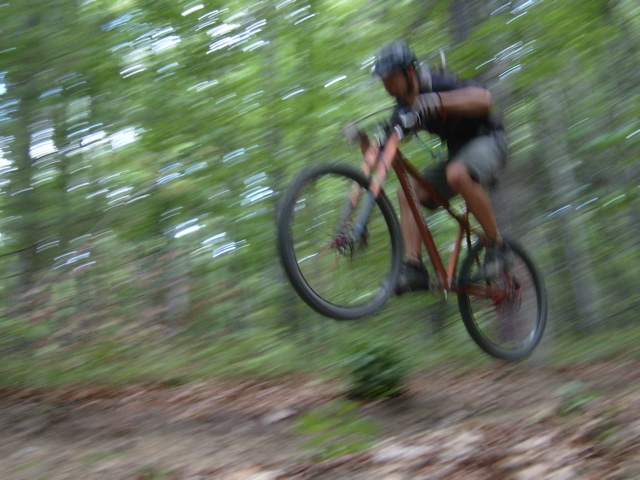 I really wished I had kept better records of what we did, what we saw, and where we rode that day in 2008. 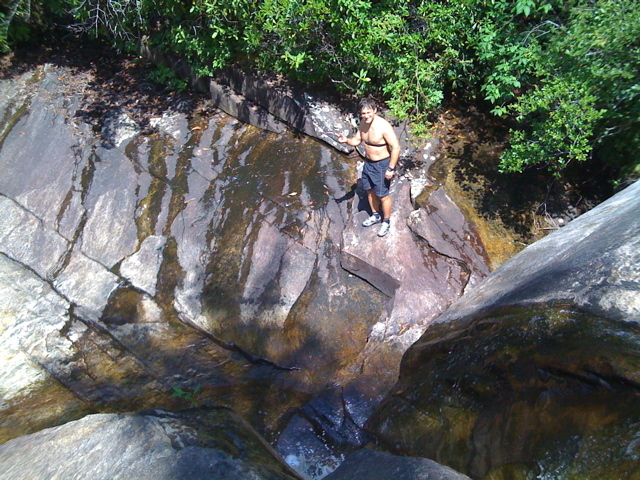 Somehow, we came across another set of smaller falls that were much more secluded. We parked the bikes and went into "exploring" mode. I remember it being incredibly peaceful and beautiful. I also remember nearly falling to my death. If it wasn't for Kristian's quick reflexes, who knows what may have happened. He reached out and grabbed me before I could tumble down the rocks. Sitting here writing this, I can't remember any particular conversation. I just remember being happy. Being content. I remember just having a great time with really good friends. Finishing our ride for the day, we headed back to camp. That night we decided to drive to downtown Brevard to find some ice cream. We ended up at Rocky's Grill & Soda Shop on the main street in town. I can't remember anything specific about what I purchased or how good the ice cream was. What I do remember is sitting outside of the shop with Glenn and just relaxing. It almost seemed as though time was slowing down. Kristian and Mark made their way to a toy store around the corner from the ice cream shop. In the window of the store there were toy "white squirrels" everywhere. It was the town mascot. The store owner told us the legend of the white squirrel. If I remember correctly, according to local legend, sometime in the 1940s or 50s, a carnival truck overturned in the area and a number of the creatures escaped. Whether true or not...you will find plenty of white squirrels in the area. The thing that I remember the most about our trip into town that night was that the streets were shut down that night for dancing. Yes, dancing. Some local musicians came out and there were people square-dancing in the street. Now that's cool. The next day...the final day of the trip...we rode some more. If I remember correctly, we retraced a lot of our paths and had just as much fun. On our last day in North Carolina we headed back to DuPont State Forest. Again, we climbed up Ridgeline Trail...but this time we came to the conclusion that riding down this trail would be a blast. We turned around and couldn't have been more correct. One word came to all of our minds at the same time..."Again!" 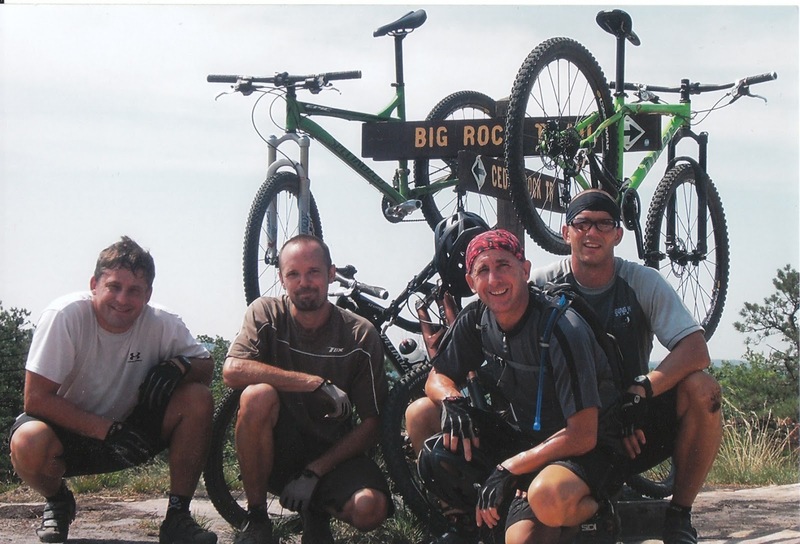 We spend the next 3 hours climbing and descending Ridgeline Trail. 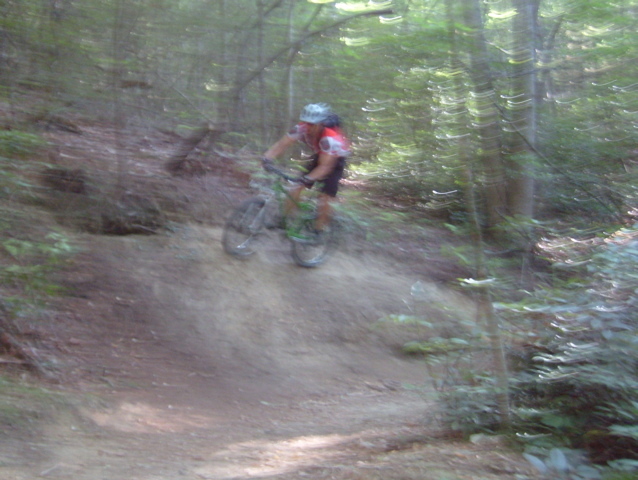 I had never ridden a trail that flowed as well as that one. It was an incredible way to end a perfect mountain biking trip. 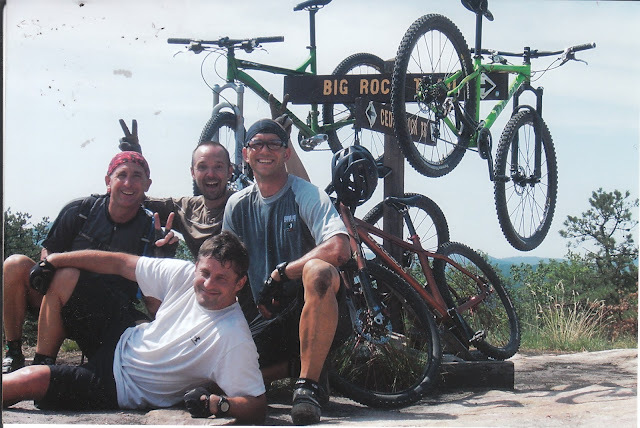 This definitely wasn't the last ride that Glenn, Mark, Kristian, & I would be on...but it would be the last big trip for the four of us. Eight years later, I am still friends with Mark...but have lost touch with both Glenn and Kristian. I hate to admit it, but it's my fault. I made some poor decisions in the months that followed that drove a wedge between us. 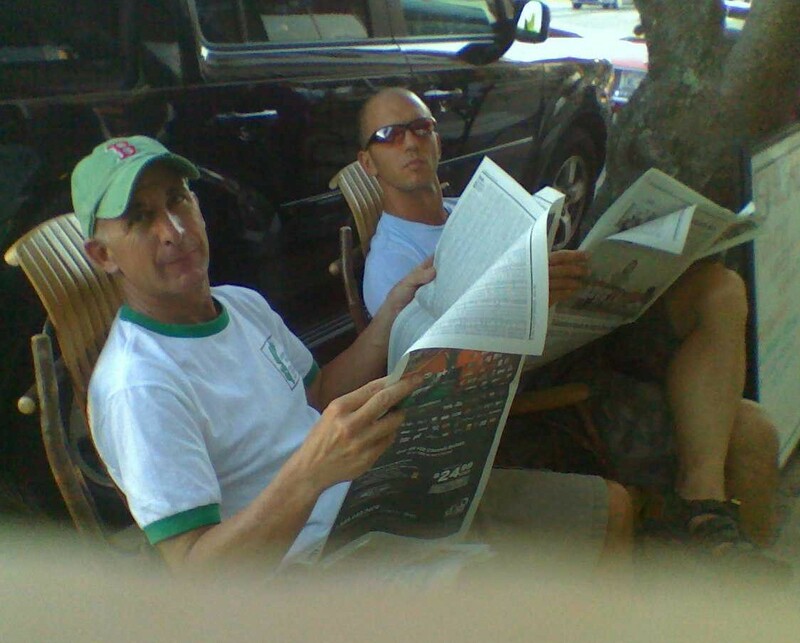 Mark and I went through a turbulent time and eventually came out of it even better friends. I apologized to both Glenn and Kristian...but we were never as close as we were that week in 2008 (and I regret that deeply.) I miss them. The legend of the white squirrel, however, continued to live on...that's a story for another day. 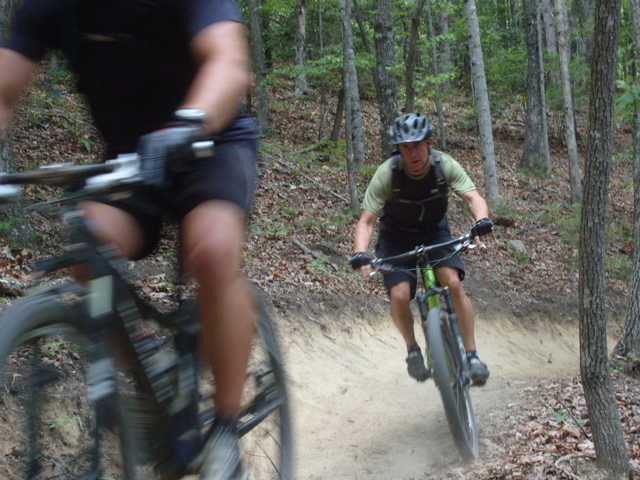 Click HERE to see all the ride pics from that week in 2008 or go to ALL TRAILS LEAD TO ICE CREAM's website to check our all of our rides and pics!